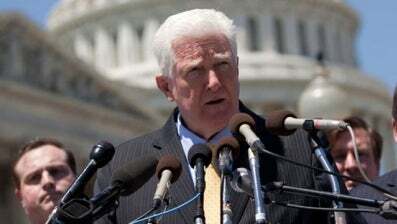 Fox News is reporting on comments made by Rep. Jim Moran (D-Va.) following Tuesday's State of the Union address. The congressman told the Arab network Alhurra that Democratic losses can in November's midterm elections can be traced to voters who "don't want to be governed by an African American, particularly one who is inclusive, who is liberal, who wants to spend money on everyone and who wants to reach out to include everyone in our society." Moran said much of the criticism of Obama comes from a "selfish and close-minded perspective." This theory certainly isn’t a new one. But an elected representative's willingness to brave the political repercussions of saying it out loud (watch for "race card" and "reverse racism" claims from pundits on political talk shows this weekend — we can already sense the glee of the Fox News audience as they seize on this) is nothing short of shocking. Thank you, Rep. Moran, for saying something that seems obvious to many of us, but that our pragmatic president is far too disciplined to ever say for himself. In other news: CNN Announces Black Managing Editor.